Allegory – A figurative treatment of one subject under the guise of another in order to persuade; a parable. Allegory is the use of fictional characters on the literal level of a story to unravel the abstract, philosophical, divine, historical, social, moral, mythological, religious or political meaning lying underneath its surface. Great allegories have many levels of meanings. In some cases, it might serve as protection against one’s enemies as it lacks direct accusations. Sometimes, allegorical works use personification to underline the hidden symbolic meaning. At other times, the story runs like any other story at the surface, but for those who care to see, there is an underlying meaning. In To Kill A Mockingbird (of course, Harper Lee says “it’s a sin to kill a mockingbird”), there is an allegorical connection between the innocent mockingbird and the innocent Tom, who is wrongly accused of attacking a young woman. As to whether To Kill a Mockingbird is a children’s book or not, I refer you to the ongoing debate in Nathan Bransford’s blog, This Week in Books. Allegory is also used for satire. 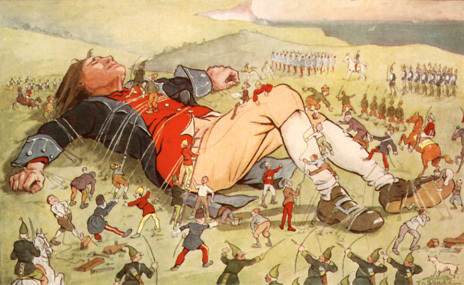 Gulliver Travels, by Jonathan Swift, uses allegory to show the discrepancy between what man thinks he is (cultured, rational, truthful, virtuous) and how he acts (brutally, selfishly, irrationally, viciously). In Animal Farm, George Orwell personifies animals to satirize the corruption in politics. In the book, Orwell shows how politicians dupe the public to come into power, enjoy life at their expense through manipulation and keep changing their ideals to suit their needs. This is shown through the medium of an animal farm, which symbolizes the world; the pigs are the politicians, the farm animals the public. What better way than to call politicians pigs and then throw your hands up in allegorical innocence! I never finished reading The Fairie Queene by Edmund Spenser which was assigned by one of my undergraduate professors at Western Carolina. Maybe I will some day. It reads smoothly because the rhyming is perfect. The poem was written in praise of Queen Elizabeth I. The allegory is couched in the mythological setting of “Faerieland” with the presentation of morality through Arthurian knights exemplifying various virtues. But though it is one of the longest poems in English, it was never completed. A Tale of a Tub by Jonathan Swift, though considered religious allegory, is another of Swift’s satiric parodies on society. More serious and profound than Gulliver’s Travels, a large part of the work consists of a “tale” of three brothers, each representing one of the main branches of western Christianity. Considered difficult to decipher by scholars, a number of “keys” similar to Cliff’s Notes were written by Swift’s contemporaries who were eager to interpret the work. Consolation of Philosophy (perhaps the last Classical work of literature), written in 542 by Boethius, treats of morality without being specifically religious. Boethius believed in harmony between faith and reason, and that the truths found in Christianity are the same as those found in philosophy. Lord of the Flies by William Golding is an overall allegory for a society that has let savagery take over; morality is almost non-existent on this island. Individually, Simon stands for the innate morality of man and Piggy for intellect which cannot exist under overwhelming savagery. The naval man, representing civilization, restores order to the island. Allegory is found less often in literature for younger children than the more straightforward approach.